The three bridges in the park are named Kachina, Owachomo, and Sipapu (the largest), which are all Hopi names. A natural bridge is formed through erosion by water flowing in the stream bed of the canyon. During periods of flash floods, particularly, the stream undercuts the walls of rock that separate the meanders (or "goosenecks") of the stream, until the rock wall within the meander is undercut and the meander is cut off; the new stream bed then flows underneath the bridge. Eventually, as erosion and gravity enlarge the bridge's opening, the bridge collapses under its own weight. There is evidence of at least two collapsed natural bridges within the Monument. In 1904, the National Geographic Magazine publicized the bridges and the area was designated a National Monument April 16, 1908 by President Theodore Roosevelt. It is Utah's first National Monument. The Monument was nearly inaccessible for many decades (a three-day horseback ride from Blanding, Utah, the nearest settlement), as reflected by the visitor log kept by the Monument's superintendents. 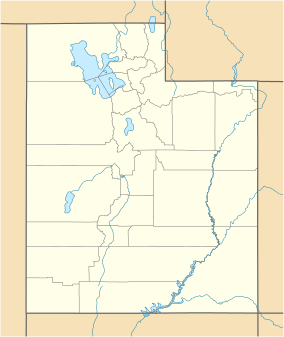 The park received little visitation until after the uranium boom of the 1950s, which resulted in the creation of new roads in the area, including modern day Utah State Route 95, which was paved in 1976. The bridges and other features present on the Colorado Plateau today were molded by the processes of erosion. The destructive forces of wind and rain, running water, and freezing temperatures attacked the uplifts as soon as all the tectonic havoc started in the Late Cretaceous. The Colorado Plateau has been uplifted about 12,000 feet (3,660 m) since the end of the Cretaceous about 66 million years ago. Some of this uplift occurred geologically rapidly. As the rate of uplift increased, so did the rate of erosion. The Colorado River, for example, carved its present course within the last 6 million years. With uplift, streams throughout the Colorado Plateau began to dissect the topography into the landscape we see today with unprecedented vigor, carving the rocks and carrying away the dismantled strata into the landscape we see today. The Monument's elevation ranges up to 6,500 feet (2,000 m). The Monument's vegetation is predominantly pinyon-juniper forest, with grass and shrubs (brittle brush, Mormon tea, sage, etc.) typical of high-elevation Utah desert. In the canyons, where there is more water and seasonal streams, riparian desert plants, such as willow, oak and cottonwood trees, thrive. Because the Monument has been closed to grazing for nearly a century, and off-road motorized travel is restricted, Natural Bridges contains extensive areas of undisturbed, mature cryptobiotic soils. Earthquake potential is high along the Moab Fault in nearby Arches National Park, Southeast Utah Group (SEUG). While this and other faults in the Paradox Basin are associated with salt structures, the Colorado Plateau interior does possess a low level of seismic hazard. Ground shaking from earthquakes may impact the bridges at Natural Bridges National Monument causing catastrophic failure of one or more of the bridges. Cryptobiotic soil crust within the park. The main attractions are the natural bridges, accessible from the Bridge View Drive, which winds along the park and goes by all three bridges, and by hiking trails leading down to the bases of the bridges. There is also a campground and picnic areas within the park. Electricity in the park comes entirely from a large solar array near the visitors center. In 2007, the International Dark-Sky Association named Natural Bridges the first International Dark-Sky Park, which is a designation that recognizes not only that the park has some of the darkest and clearest skies in all of the United States, but also that the park has made every effort to conserve the natural dark as a resource worthy of protection. To date, Natural Bridges has the only night sky monitored by the NPS Night Sky Team that rates a Class 2 on the Bortle Dark-Sky Scale, giving it the darkest sky ever assessed. Horsecollar Ruin is an Ancestral Puebloan ruin visible from an overlook a short hike from Bridge View Drive. The site was abandoned more than 700 years ago but is in a remarkable state of preservation, including an undisturbed rectangular kiva with the original roof and interior, and two granaries with unusual oval shaped doors whose shape resembles horse collars (hence the site's name). Animals species found in the National Monument include birds such as the pinyon jay, canyon wren, and turkeys (which were reintroduced by the State of Utah to the table-lands above the Monument) and mammals like rabbits, pack rats, bobcats, coyotes, bears, mule deer, and mountain lion. The Monument's pygmy rattlesnakes have been the subject of occasional study; several species of lizard common to southern Utah are abundant. In May 2006, KSL Newsradio reported a case of plague found in dead field mice and chipmunks at Natural Bridges. Native plant species include willow, cottonwood, Douglas fir, ponderosa pine, pinyon pine, juniper, grasses, annuals and perennials such as asters, penstamons, buckwheats, and Indian paintbrush, and various shrubs such as dwarf oaks, bayberry, manzanita, buffaloberry, rabbitbrush, blackbrush, brittlebrush, Apache's plume, sage, yucca, and Mormon tea. Invasive species include tumbleweeds, certain thistles, dandelions, and tamarisk. Much of the monuments ground is covered in communities of cryptobiotic soil crusts, which prevents soil erosion and promotes retention of soil nutrients. ^ "Natural Bridges National Monument". Geographic Names Information System. United States Geological Survey. Retrieved November 1, 2011. ^ "Listing of acreage as of December 31, 2013". Land Resource Division, National Park Service. Retrieved 2012-05-14. ^ "NPS Annual Recreation Visits Report". National Park Service. Retrieved 2017-09-29. ^ "Sipapu Natural Bridge". Natural Arch and Bridge Society. ^ a b Olson, Jeffrey G. "Natural Bridges named the world's first international dark-sky park". Natural Bridges National Monument. National Park Service. Retrieved 3 May 2018. ^ "Utah's Natural Bridges National Monument Becomes First International Dark Sky Park" (PDF). International Dark-Sky Association. 2007-04-19. Archived from the original (PDF) on 2008-11-15. Retrieved 2008-11-09. ^ "Night Sky Quality Monitoring Report". Explore Nature. National Park Service. Retrieved 3 May 2018. ^ "Campground Closes Because of Plague". KSL Newsradio. May 16, 2006. Retrieved 2006-12-15. 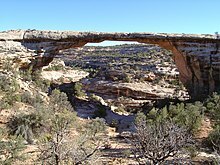 Wikimedia Commons has media related to Natural Bridges National Monument. Wikivoyage has a travel guide for Natural Bridges National Monument. This page was last edited on 19 March 2019, at 19:25 (UTC).